Revised January 11, 2006 - Representing only Socially acceptable companies. Giving my Clients, Their Companies, Their Product or Service and their (potential) Customers the Highest Quality, Efficient, Effective and Excellent Service, Representing You Enthusiastically and Professionally. University studies show that most people loose 40% of what is said within the first 20 minutes, 6 hours they loose 60% unless there is a 'Hook' or a 'Memory Peg'... something Unique or Unusual. Physiology 101 States: If the Brain judges the Experience to be inherently Fascinating or Novel it becomes a permanent part of the memory. There are other hooks out there but Exhibit Surveys. 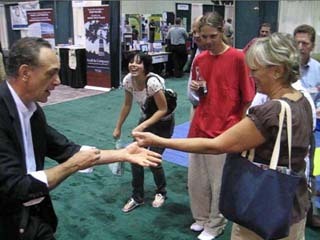 Com shows statistically that Magic/Magicians are the second biggest draw at a Trade Show Booth; number one is a product demonstration. What happens if you can't demonstrate your product or Service? Will you be forgotten? Not so, if you have a 'Hook/memory peg'. And if you can demonstrate a product or Service and incorporate it into the magic you can then increase the effectiveness of the message. Magic is shown to be the most effective catalyst because it works on so many levels, it involves many of the senses plus it evokes some of the strongest emotions especially laughter and Amazement. 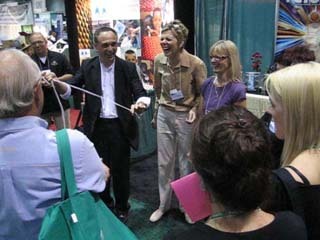 Either way, you can be Guaranteed that Al Coury magic will Maximize your presence at the Trade Show! Increase Sales, Increase Leads, Guaranteed! Please see top right picture, notice the vendor with the dark shirt, next to me, left side of picture, he was enjoying the magic, well what else could he do when all the attendees were at my clients booth? 'Warning' Common occurrence as you can see at picture to right, attendees do double up with laughter.